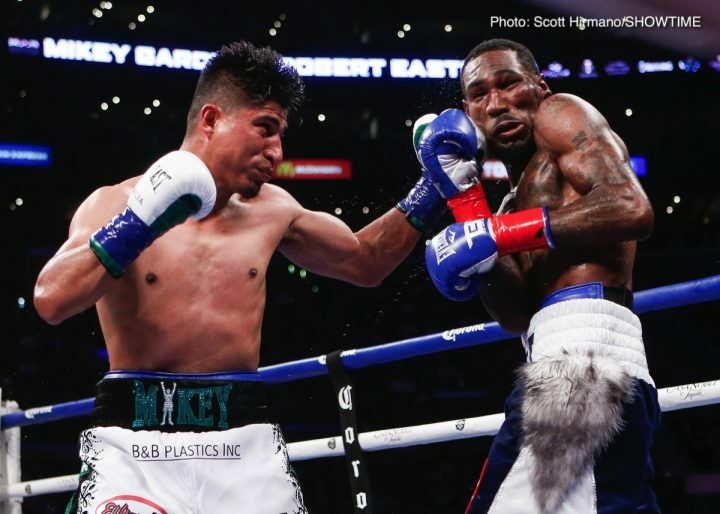 By Aragon Garcia: Former WBO light welterweight champion Chris Algieri doesn’t like Mikey Garcia ‘s chances of beating IBF welterweight champion Errol Spence Jr. on March 16. According to Algieri, he sees the Spence-Garcia fight being won by Spence based on his size advantage that he’ll have over Mikey. Spence close to four inches taller with a longer reach, and he’s likely going to be heavier when the two enter the ring on March 16 at the AT&T Stadium in Arlington, Texas. Just how much heavier is still up in the air. Mikey (39-0, 30 KOs) is bulking up by the day at the SNAC facility with his weight training and various other resistance exercises. Mikey would obviously do better if he had six full months to pack on the weight, but he’s going to have to be satisfied with the three months that he’ll have been training by the time he fighting Spence (24-0, 21 KOs) in their fight on FOX pay-per-view. “Mikey Garcia is a great fighter. He’s not just a good fighter. Errol Spence is going to be a great fighter,” Algieri said to esnewsreporting. “He’s got more to accomplish before you can actually consider him great, but I do believe he will be. We have weight classes for a reason. So I see that as a win for Errol Spence based on what he brings to the table plus being the bigger man,” Algieri said. Algieri (23-3, 8 KOs) is biased obviously, considering that he lost to Spence by a fifth round knockout three years ago in April 2016. Algieri didn’t try and box Spence. He fought his fight by getting in the trenches and trading with him. Spence used his size and power advantage to destroy the weaker Algieri in that fight. Algieri is making an assumption that Mikey will lose to Spence because he’s the smaller guy. Algieri wouldn’t say that if he didn’t have a bad experience with Spence in losing to him in 2016. Mikey plans on fighting Spence a lot differently than Algieri. He’s going to use his brains, agility, boxing brain and speed to beat him. Mikey is going to do everything that Spence doesn’t expect in order to beat him. “I see that as a 50-50 fight,” former WBC super middleweight champion David Benavidez said to esnewsreporting in giving his own prediction of the Spence vs. Garcia fight. Benavidez (20-0, 17 KOs) has seen Mikey fight and train, so he knows what he’s capable of doing inside the ring with the 5’9 1/2″ Spence. It’s a 50-50 fight in Benavidez’s mind. He knows that Spence can’t count on winning the fight based on his size, because Mikey can neutralize his size with his agility, speed and ring intelligence. It’s not going to be easy for Mikey, but he knows he can take away all Spence’s advantages in his size and power. What Spence saw when he first saw Mikey start training camp is what anyone would see when they see a guy that has been eating to pack on a lot of size in a short period of time. It would be that way with Spence if he decided to move up to light heavyweight. He would have to eat a lot before he started training camp in order to get his way in the 200 lb range so that he could burn off a little of that weight when it came time to weigh-in. Mikey put on the size, and now it’s up to the experts at the SNAC facility to add a little more muscle before trimming Mikey down to the 160s which is where he’ll be for the fight. Once his weight is right, he’ll be ready to give Spence the fight of his life on March 16.